If you suffer from acne, and let's face it, most of us do at some point, then you search for an antidote that will help treat pimples during the day and night while you wear makeup and while you sleep. You want something that isn't harsh, doesn't dry out the skin and doesn't cause redness and irritation. I have something in that vain. It is called the DERMAKR Discreet Acne Pimple Patch. These patches are from Korea. Instead of containing traditional acne medicine they contain Hydrocolloid, which is technology that absorbs the pus, bacteria, sebum and liquid discharge of acne lesions through the permeable layers of your skin, soothing irritations all while protecting the troubled area from further infection and scarring. Not only that but they are approved by the FDA. All of this in a little spot treatment! These patches turn your pimples invisible instantly. They are made from ultra-thin (minimum 15 microns thin) Hydrocolloid sheets that discreetly mask unwelcome outbreaks. Confidently go about your day while protecting your irritated skin from scarring and infection. These patches are discreet even on the go. They are waterproof and lifeproof. The proprietary production methods allow DERMAKR to be the skin-like acne cover sticker on the market, so it's so thin and light that you can put makeup over the patch as if it were your own skin. With these patches not only can you 'cure' problematic skin and also effectively treat cystic acne, but manage the trouble it offers. DERMAKR also offers a LIFETIME MANUFACTURER'S GUARANTEE. To prove how confident they are in their product, they are offering a lifetime money back guarantee with every purchase. If you are not completely satisfied with your patches, they will refund your purchase with no exception. The DERMAKR Discreet Acne Pimple Patch is on sale for a limited time only. And be sure to be aware of counterfeit products, as DERMAKR is the only SOLE distributor of the DERMAKR Discreet Acne Pimple Patch. What I love so much about these patches is that they heal acne lesions so quickly. These are a fast and efficient method for acne treatment. This round, clear patch sticks directly onto a pimple and is left on overnight on clean, dry skin. It dries out acne by absorbing all of the excess sebum, pus, bacteria, irritants and any other liquid discharge, which leaves the perfect healing space for the skin to repair itself. It is very efficient that some acne can even dry out and disappear by morning. What is nice is that these are very sticky and stay on so well that you can put makeup on over them and they are even waterproof. To me that is great. I have always wanted to have an acne patch that was waterproof and that I could use with makeup over it. Mainly, it is essential that you apply the patch upon immediately seeing the pimple when it arises. That is the quickest and best way to treat it. Especially before infection forms (before pus forms). Once pus has formed the infection is harder to treat. But these patches do a great job of absorbing the contents of the pustule. Since these are non-irritating, one patch can be applied right after another. 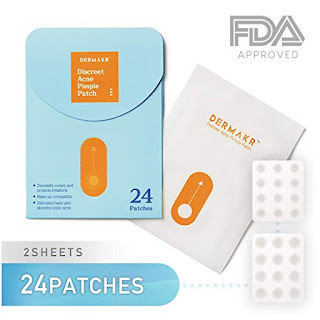 The DERMAKR Discreet Acne Pimple Patch is available from www.amazon.com. These can be purchased in a one time format or in a subscription format. Obviously the subscription will be less-expensive and save you money. I have used other patches before but have not had the luck that I have had with this one. I like this one more than any other acne patch I have used and I feel these are the best ones. They have several benefits that I mentioned above that others do not. If you try them you will not be disappointed. But if you are, there is that guarantee.